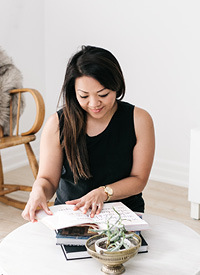 Blog Brunch Toronto — Love On Sunday Love On Sunday | Interior Styling in Toronto and the GTA. It's called the Brazen Benedict and it's absolutely delicious. Probably not the healthiest item on the menu but so worth the extra calories! Brazen Head is now one of my top breakfast destinations. You must go! The atmosphere was so cozy and inviting. The large Christmas tree, warm fireplace and rustic decor helped us forget about the frigid temperatures outside. Clockwise: Dani, Michelle, Melissa, Casey, Lindsey, Nicki is missing (took this photo), Alyssa, Me, Renee and Sara. It was great to see some familiar faces and meet some new ones as well. I'm always eager to pick the brains of other bloggers, hear their frustrations and share some of mine as well. So thanks to Melissa for organizing such a great brunch and to all the ladies who attended. It was informative and fun and such a great start to my weekend!